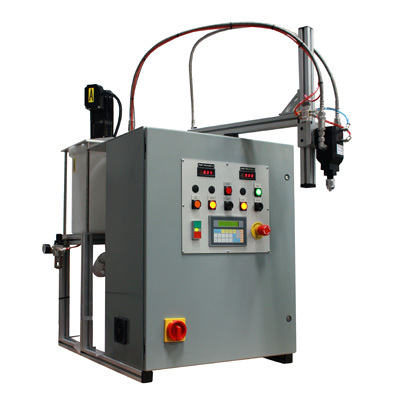 The T-1000 Multi Component Dispensing System is a flexible digitally controlled bench-top meter mix system. This system features FRs proprietary positive displacement pump technology ideal for medium to high volume dispensing requirements. The T-1000 includes FRs proprietary microprocessor controls with a touch pad user interface. Capable of up to 75 stored dispense programs coupled with the lowest industry maintenance requirements make this meter mix system the most reliable and cost effective machine available. The T-1000 is built to exacting specifications, providing superior handling, mixing and reliable dispensing of nearly all epoxy, silicone and urethane 2-part materials. Compatible with MMU/Never Empty.